It’s been three months since we moved and I realized I never shared a few last minute updates on our previous house (henceforth to be known as House2). Once we found our dream house (House3), we had to list House2 at lighting speed. We had about a week to work through a huge to-do list, and there were many nights we were up until 1am working our tails off. 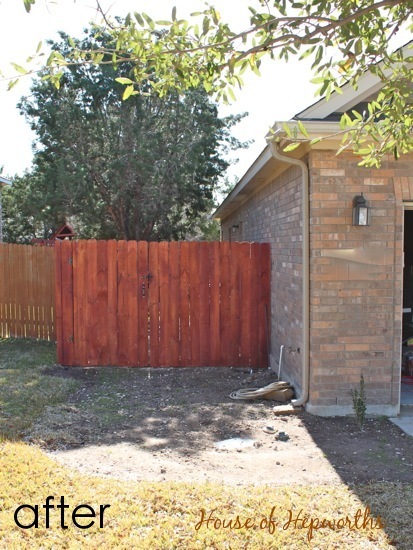 One major thing on our list was the side yard. 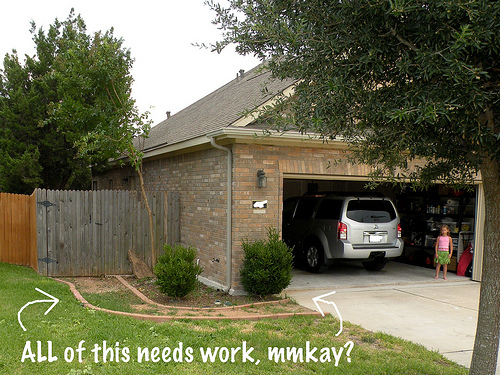 It was a mess when we bought the house, and pretty much continued to be a hot mess for the following three years. We knew if we didn’t take care of the grass issue, we’d never sell the house! And one more. I blogged about it previously here. And you know what is like goose-bumps weird? This old post was on August 24, 2010. Three years ago almost to the day. Weird. Apparently August is my blog-about-the-yard month. Fast forward to March of last year. 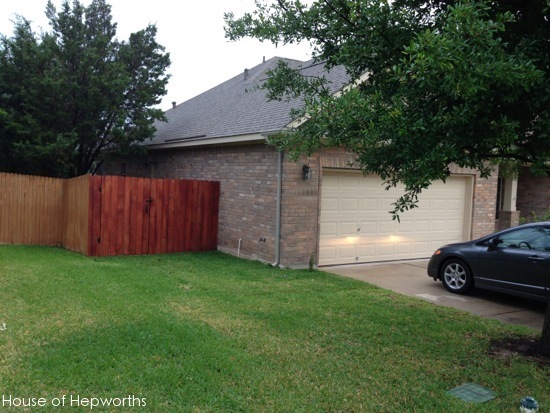 Our fence fell over in a wind storm so we had to build a new fence and gate. Don’t mind the “after” on the photo. I lifted the photo from that post. We were so busy prepping the house that we couldn’t sod the yard until like 9pm. In the dark. 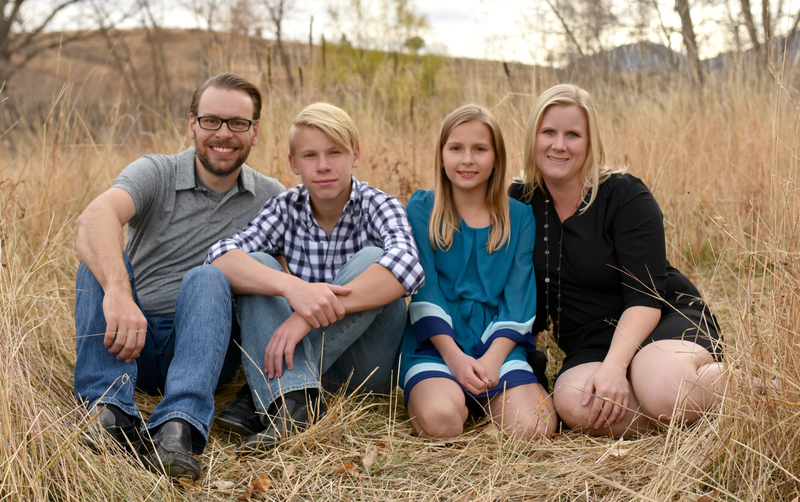 With a Honda Civic (we had just sold the minivan and were a one-car family while we did Dave Ramsey’s Total Money Makeover). It was hella fun sodding a yard in the dark. 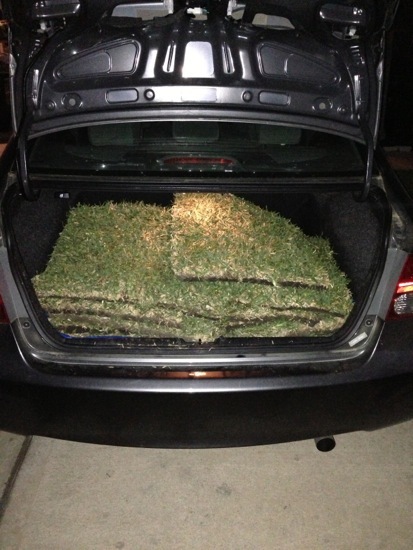 We used over 60 pieces of sod and two trips to pick it up. I think we finished at around midnight. I waited until the morning to snap a picture so that you could actually see it. Why did we wait 3 years to do this? How come whenever you sell a house you do all those projects to make it perfect for the next owner instead of just doing the projects 3 years prior so you (the current owner!) can actually enjoy them? I’m sure the neighbors were so happy to see this eyesore finished. And here was the yard about a month later, the day before we closed on it. I kinda wanted to roll around in it. But I didn’t. I do have some standards. You guys, I’m seriously embarrased about these “before” photos. 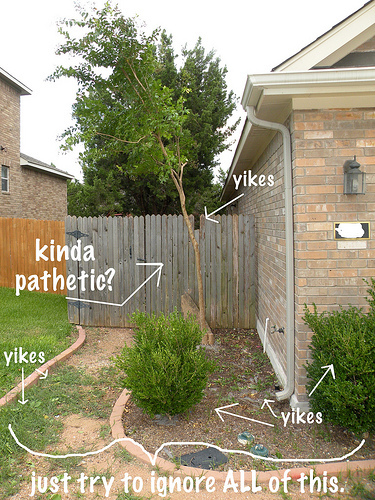 Check out how awful the yard use to be (and how pretty it is now). 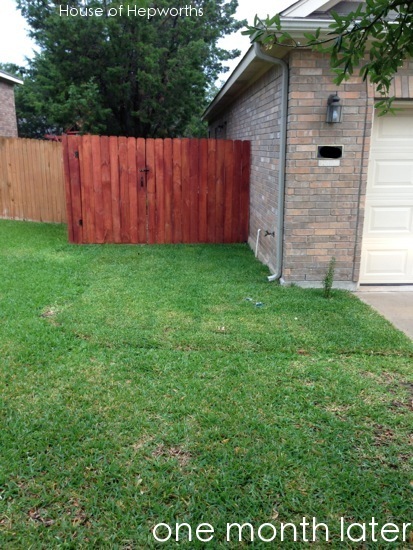 Here you can see the prepping of the yard for sod, sodding, and then what it will look like a month later. This is the biggest project we tackled to get the house ready to sell. All in all we spent just under $100 on sod (around 60 squares). 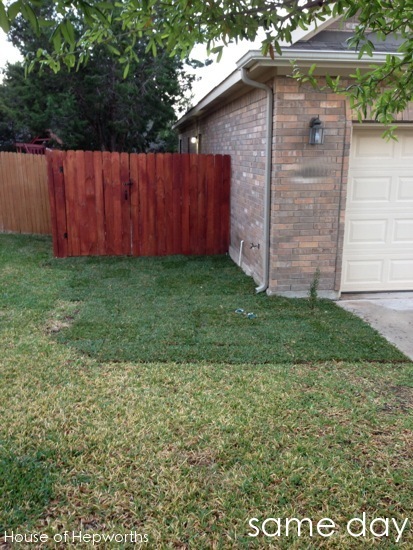 Adding sod is an inexpensive update that gives you the most bang for your buck. Just make sure you water it! And it’s also easier to lay sod in the daylight, but in a pinch midnight works too. Unfortunately I have first-hand knowledge of that! Oh, and PS, this type of grass is called St Augustine. I’m not sure if they have it everywhere but in Texas it’s pretty popular. I much prefer St Augustine over Bermuda any day. As soon as we put in a sprinkler system in House3, St Augustine is going in asap. But that might be awhile. Boo. I think the previous owners thought they were sprucing up the place, but it looked awful. I had to rip everything out and start over with sod. 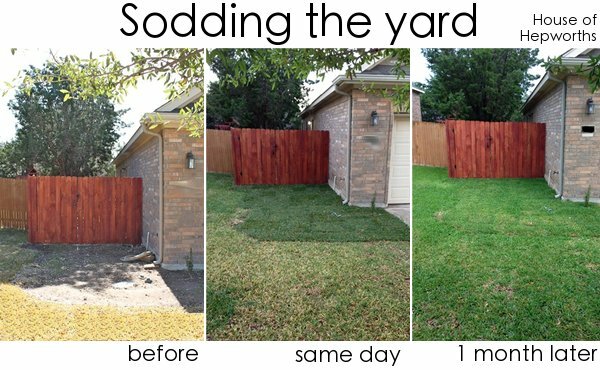 I remember when I sodded my yard five years ago. What a pain! You did much better than we did on our first attempt that’s for sure. 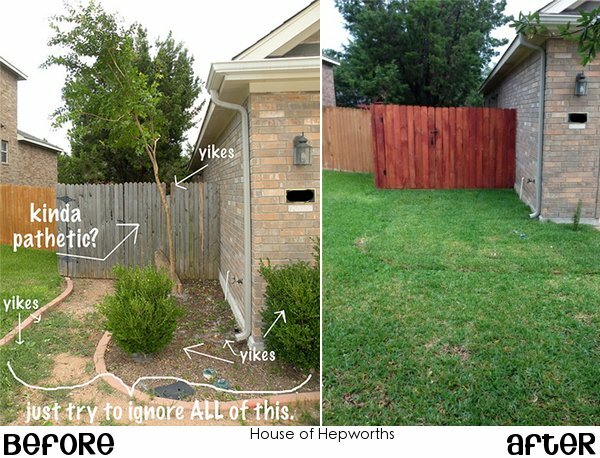 Your yard looks great! Thanks for the compliment! It was a huge pain but we had to get the house sold.